Discussion in 'Google TV General Discussion' started by sparkyscott21, Dec 31, 2010.
shows, Web sites, and LG apps. 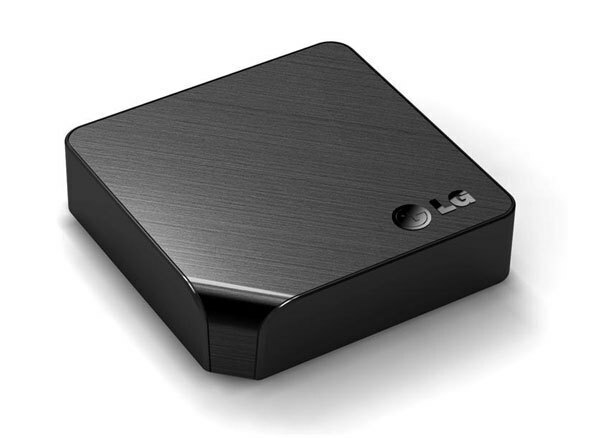 Transforming a traditional TV into a smart TV will be made possible with a Smart TV Upgrader LG Electronics will be unveiling next week at the Consumer Electronics Show (CES), the company said Thursday. The 11-inch ST600 will give owners of regular TVs access to all of LG's Internet-enabled smart TV functions, including premium online content, Smart Share, and LG Apps. Users will also be able to find shows, movies, language classes, and games, and access sites including Netflix, YouTube, Vudu, and Pandora Internet radio, as well as run Yahoo TV widgets. "The market for smart TVs is set to take off this year, and the ST600 offers a perfect entry point," said Havis Kwon, president and CEO of LG Home Entertainment Co., in a statement. "With the LG Smart TV Upgrader, we're taking the excitement and convenience of smart TV and adding in LG's trademark ease of use because we see a significant audience who are interested, but not interested enough to buy a whole new TV." The device comes with a BCM7615 processor, Wi-Fi, Ethernet, and Digital Living Network Alliance (DLNA) connectivity to transfer content from compatible PCs; 384 MB of RAM; 1 GB of flash storage; a Web browser; finger-touch RCU input device; and USB. It also has an LG add-on architecture. The Seoul-based consumer electronics maker did not release pricing for the ST600 but said it would be "an affordable price," and that it would be available in the second quarter of 2011. The product will compete against devices and services including Roku, TiVo, Boxee Box, Seagate, and Western Digital. LG has been on a product-launch tear in advance of CES. Earlier this week the company announced it will roll out the largest LCD TV ever to hit the market. The company also said it will release the first dual-core smartphone next month in Korea.